What happens in a Community Health Club? Africa AHEAD Project Manager Nancy Maksimoski conducted a 3-day workshop on the CHC Methodology for EWS staff 17-19 August 2010 in Durban. The training covered Modules 1 (Feasibility: Rationale for the Community Health Club Approach) and 2 (Planning: How to Start a Community Health Club Project) of Africa AHEAD’s CHC Manual. For this project, 8 EWS Health Promoters will each be responsible for forming and facilitating 5 CHCs, to be implemented in a combination of informal settlement and rural communities. 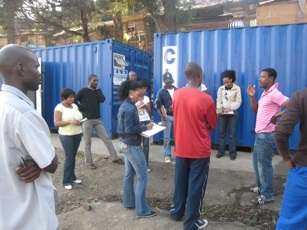 After an introduction to the AHEAD methodology on the first day, the group discussed the challenges facing informal settlements, and the HPs feared there was little that could be done to convince community members to take ownership of the communal facilities – a problem that is seen as the core issue behind many of the challenges the HPs identified. On the second day of the training, Africa AHEAD led the HPs on a transect walk and mapping exercise of Siyathuthuka, with the assistance of community leader Nhlanhla and resident Innocent. As Khethokuhle (Siyathuthuka’s CHC) has only just begun its CHC sessions, its current state is very similar to that at baseline. 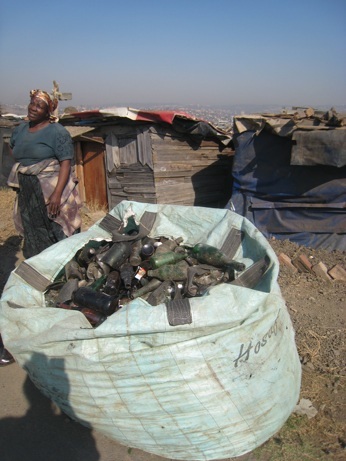 The group noted that while the container toilets provided by EWS are very well maintained by its caretaker, grey water, illegal dumping, and illegal taps are problematic in the community. Participants engaged Nhlanhla and Innocent in discussion about many of the issues they highlighted earlier in the workshop, in order to understand these matters from the perspective of a community leader/resident. To illustrate the difference CHCs can have on communities, the HPs were then taken next door to Boxwood Place, where Impiloyethu has been active for the past year. Not only could the group visibly see the differences between the two communities and view Impiloyethu’s projects, but they were able to talk with CHC members and hear their stories about how health clubs have improved their lives. After the site visits, the attitudes of the Health Promoters towards the concept of ownership had noticeably changed. Although still thought to be a challenge, they agreed that it was something the health clubs could achieve and their enthusiasm became very tangible. In order to better understand the dynamics of a CHC, the group formed their own mock CHC, Vukuz’ thatha (Get up and do it for yourself), which they will continue to be members of for the remainder of the upcoming trainings. In addition to the site visits and presentations, Africa AHEAD facilitated discussions on the roles and responsibilities of the project’s stakeholders, mobilisation, and other important topics. Participants also acted in several helpful role-playing exercises, such as how one engages with community leaders, which can be problematic as these people often act as gatekeepers to the community. By the end of the three day training, the group had a clear understanding of the CHC methodology, plans to begin engagement of Councillors and Community Leaders, and were enthusiastic to start the project. Africa AHEAD left the group with the homework of choosing the communities they wish to implement the project in, engaging the relevant project stakeholders for each community, as well as to begin the mobilisation and registration process for the health clubs. Africa AHEAD is very pleased with the results of the workshop and is looking forward to seeing what the group is able to achieve in the upcoming weeks before September’s workshop.